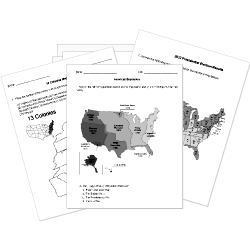 You can create printable tests and worksheets from these Grade 6 Civil War questions! Select one or more questions using the checkboxes above each question. Then click the add selected questions to a test button before moving to another page. A person who works to bring an end to slavery is called a(n) . What was the name of the series of safe houses abolitionists used to give shelter to slaves escaping to the North? What was the name of William Lloyd Garrison's abolitionist newspaper? Why were some abolitionists unhappy with the Emancipation Proclamation? It did not apply to the entire country. They felt Lincoln had issued it too soon. They wanted the South to be punished for starting the war. It freed too many slaves too quickly. The Civil War was the first war that the United States citizens fought against one another. Which abolitionist gave the speech "Ain't I a Woman?" Religious denominations and were among the first to call for an end to slavery. At what location did Lee surrender to Grant? Plantations were large farms that became a major part of southern culture. What were the Southern Soldiers called? Where did the majority of slaves work in the South? Which term best describes the Battle of Gettysburg?